Schematic representation of the flow of nitrogen through the environment. The importance of bacteria in the cycle is immediately recognized as being a key element in the cycle, providing different forms of nitrogen compounds assimilable by higher organisms. The basic Earth's atmosphere is about 78 percent nitrogen, making it the largest pool of nitrogen. Nitrogen is essential for many biological processes; it is in all amino acids, is incorporated into proteins, and is present in the bases that make up nucleic acids, such as DNA and RNA. In plants, much of the nitrogen is used in chlorophyll molecules, which are essential for photosynthesis and further growth. 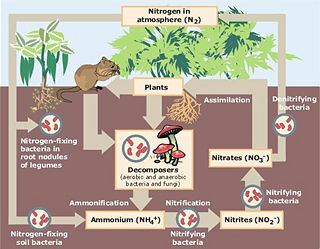 The nitrogen cycle reveals the harmonious coordination between different biotic and abiotic elements. Processing, or fixation, is necessary to convert gaseous nitrogen into forms usable by living organisms. Some fixation occurs in lightning strikes, but most fixation is done by free-living or symbiotic bacteria. These bacteria have the nitrogenase enzyme that combines gaseous nitrogen with hydrogen to produce ammonia, which is then further converted by the bacteria to make its own organic compounds. Some nitrogen-fixing bacteria, such as Rhizobium, live in the root nodules of legumes (such as peas or beans). Here they form a mutualistic relationship with the plant, producing ammonia in exchange for carbohydrates. Nutrient-poor soils can be planted with legumes to enrich them with nitrogen. A few other plants can form such symbioses. Other plants get nitrogen from the soil by absorption at their roots in the form of either nitrate ions or ammonium ions. All nitrogen obtained by animals can be traced to the eating of plants at some stage of the food chain. The source of ammonia is the decomposition of dead organic matter by bacteria called decomposers, which produce ammonium ions (NH4+). In well-oxygenated soil, these ions are then oxygenated first by nitrifying bacteria into nitrite (NO2-) and then into nitrate (NO3-). This two-step conversion of ammonium into nitrate is called nitrification. Ammonia is highly toxic to fish life and the water discharge level of ammonia from wastewater treatment plants must often be closely monitored. To prevent loss of fish, nitrification prior to discharge is often desirable. Land application can be an attractive alternative to the mechanical aeration needed for nitrification. Ammonium ions readily bind to soils, especially to humic substances and clays. Nitrate and nitrite ions, due to their negative electric charge, bind less readily since there are less positively charged ion-exchange sites (mostly humic substances) in soil than negative. After rain or irrigation, leaching (the removal of soluble ions, such as nitrate and nitrite) into groundwater can occur. Elevated nitrate in groundwater is a concern for drinking water use because nitrate can interfere with blood-oxygen levels in infants and cause methemoglobinemia or blue-baby syndrome. Where groundwater recharges stream flow, nitrate-enriched groundwater can contribute to eutrophication, a process leading to high algal and blue-green bacterial populations and the death of aquatic life due to excessive demand for oxygen. While not directly toxic to fish life as is ammonia, nitrate can have indirect effects on fish if it contributes to this eutrophication. Nitrogen has contributed to severe eutrophication problems in some water bodies. As of 2006, the application of nitrogen fertilizer is being increasingly controlled in the United Kingdom and the United States. This is occurring along the same lines as control of phosphorus fertilizer, restriction of which is normally considered essential to the recovery of eutrophied waterbodies. During anaerobic (low oxygen) conditions, denitrification by bacteria occurs. This results in nitrates being converted to nitrogen gas and returned to the atmosphere. Biological fixation; some symbiotic bacteria (most often associated with leguminous plants) and some free-living bacteria are able to fix nitrogen and assimilate it as organic nitrogen. An example of a mutualistic nitrogen fixing bacteria is the Rhizobium bacteria, which lives in plant root nodes. As well, there are free living bacteria, typically in the soil, such as the Azotobacter, that are responsible for nitrogen fixation. Industrial N-fixation; in the Haber-Bosch process, N2 is converted together with hydrogen gas (H2) into ammonia (NH3) fertilizer. Combustion of fossil fuels; automobile engines and thermal power plants, which release NOx. Additionally, the formation of NO from N2 and O2 due to photons and lightning, is important for atmospheric chemistry, but not for terrestrial or aquatic nitrogen turnover. As a result of extensive cultivation of legumes (particularly soy, alfalfa, and clover), use of the Haber-Bosch process in the creation of chemical fertilizers, and pollution emitted by vehicles and industrial plants, human beings are estimated to have more than doubled the annual transfer of nitrogen into a biologically available form. This has occurred to the detriment of aquatic and wetland habitats through eutrophication. The oxidation of ammonia into nitrite, and the subsequent oxidation to nitrate is performed by two different bacteria. The first step is done by bacteria of (among others) the genus Nitrosomonas and Nitrosococcus. The second step (oxidation of nitrite into nitrate) is (mainly) done by bacteria of the genus Nitrobacter. All organisms are autotrophs, which means that they take carbon dioxide as their carbon source for growth. In most environments, both organisms are found together, yielding nitrate as the final product. It is possible however to design systems in which selectively nitrite is formed (the Sharon process). Nitrification also plays an important role in the removal of nitrogen from municipal wastewater. The conventional removal is nitrification, followed by denitrification. The cost of this process resides mainly in aeration (bringing oxygen in the reactor) and the addition of an extra organic energy source (e.g. methanol) for the denitrification. Together with ammonification, nitrification forms a mineralization process which refers to the complete decomposition of organic material, with the release of available nitrogen compounds. This replenishes the nitrogen cycle. Nitrification is a process of nitrogen compound oxidation (effectively, loss of electrons from the nitrogen atom to the oxygen atoms). In plants that have a mutualisic relationship with Rhizobium, some nitrogen is assimilated in the form of ammonium ions from the nodules. All plants, however, can absorb nitrate from the soil via their root hairs. These are then reduced to nitrate ions and then ammonium ions for incorporation into amino acids, and hence protein, which forms part of the plants or animals that they eat. Nitrates are the form of nitrogen most commonly assimilated by plant species, which, in turn are consumed by heterotrophs for use in compounds such as amino and nucleic acids. The remains of heterotrophs will then be decomposed into nutrient rich organic material and bacteria or in some cases, fungi will convert the nitrates within the remains back into ammonia. Denitrification is the process of reducing nitrate, a form of nitrogen available for consumption by many groups of organisms, into gaseous nitrogen, which is far less accessible to life forms, but makes up the bulk of our atmosphere. It can be thought of as the opposite of nitrogen fixation, which converts gaseous nitrogen into more biologically useful forms. The process is performed by heterotrophic bacteria (such as Pseudomonas fluorescens) from all main proteolitic groups. Denitrification and nitrification are parts of the nitrogen cycle. Denitrification takes place under special conditions in both terrestrial and marine ecosystems. In general, it occurs when oxygen (which is a more favorable electron acceptor) is depleted, and bacteria turn to nitrate in order to respire organic matter. Because our atmosphere is rich with oxygen, denitrification only takes place in some soils and groundwater, wetlands, poorly ventilated corners of the ocean, and in seafloor sediments. Denitrification is the second step in the nitrification-denitrification process: the conventional way to remove nitrogen from sewage and municipal wastewater. Direct reduction from nitrate to ammonium (a process known as DNRA) is also possible for organisms that have the nrf-gene. In some wastewater treatment plants, a small amount of methanol is added to the wastewater to provide a carbon source for the denitrification bacteria. Humans have contributed significantly to the nitrogen cycle by artificial nitrogen fertilization (primarily through the Haber Process; using energy from fossil fuels to convert N2 to ammonia gas (NH3)); and planting of nitrogen fixing crops. In addition, humans have significantly contributed to the transfer of nitrogen trace gases from Earth to the atmosphere. N2O has risen in the atmosphere as a result of agricultural fertilization, biomass burning, cattle and feedlots, and other industrial sources (Chapin et al. 2002). N2 has deleterious effects in the stratosphere, where it breaks down and acts as a catalyst in the destruction of atmospheric ozone. NH3 in the atmosphere has tripled as the result of human activities. It is a reactant in the atmosphere, where it acts as an aerosol, decreasing air quality and clinging on to water droplets, eventually resulting in acid rain. Fossil fuel combustion has contributed to a six- or seven-fold increase in NOx flux to the Earth's atmosphere. NO actively alters atmospheric chemistry, and is a precursor of tropospheric (lower atmosphere) ozone production, which contributes to smog and acid rain, increasing nitrogen inputs to ecosystems. Ecosystem processes can increase with nitrogen fertilization, but anthropogenic input can also result in nitrogen saturation, which weakens productivity and can kill plants. Decreases in biodiversity can also result if higher nitrogen availability increases nitrogen-demanding grasses, causing a degredation of nitrogen-poor, species-diverse heathlands (Aerts and Berendse 1988). Aerts, R., and F. Berendse. 1988. “The effect of increased nutrient availability on vegetation dynamics in wet heathlands.” Vegetatio 76: 63-69. This page was last modified on 15 October 2016, at 20:39.